(CNN) - After playing coy in an interview with CNN's Paul Vercammen Tuesday night, Sarah Palin revealed on Fox Business Network that she voted for Newt Gingrich in Alaska's caucuses on Tuesday. "Newt is whom I chose up here in Alaska to best represent the ideas that many Alaskans want to see, the preferred presidential candidate in this area. That's who I cast my vote for," Palin said. Earlier Tuesday, the former Alaska governor was interviewed by CNN shortly after she voted at a caucus site in Wasilla, but refused to say who she picked in the state's contest. But later in the evening, she had an apparent change of heart when asked about her vote by Neil Cavuto on Fox Business Network. "I knew you were going to ask me that, and I am just the poorest, politician-sounding pundit. It is tough for me to spin out of a question like that when it comes from a Fox reporter. If it comes from another reporter, I can spin out of it. But since it came from you, I will tell you, I won't sound like a politician and I will tell you who I voted for tonight." Palin's husband, Todd, endorsed Gingrich in January, and the former governor made headlines shortly before South Carolina's primary when she urged voters to turn out for the House speaker in order to defeat Romney and keep to nominating process going. On Tuesday, Palin said Gingrich was best equipped to "bust through that radical left dispensation and desire to mistreat those who are defenseless, mistreat those who have disadvantages." Referring to him as "the cheerful one," a label Gingrich gave himself during CNN's Arizona debate last month, Palin said she appreciates "what he has stood for." "He has been the underdog in many of these primary races and these caucuses. My preference tonight was for the cheerful one," Palin said. She added that her husband was an independent and did not vote in the Republican contest on Tuesday. Palin ran as Republican Sen. John McCain's running mate in the 2008 presidential election. While McCain is now backing Mitt Romney, Palin said she would support Romney if he were to secure the nomination. "If Romney is the nominee, I hope I get to stand side by side with John McCain, whom I do respect, stand side by side with him in supporting Romney as our nominee," Palin said. Its good that Palin can represent all 20 voters in Alaska's Republican primary, evn though she agrees with only 15% (3) of them! Anything to get her name in the news. Gingrich is a dead-letter. If Gangrene-itch offered Palin a "spot in his administration," you can be sure it was a horizontal one. ... "If Romney is the nominee, I hope I get to stand side by side with John McCain, whom I do respect, stand side by side with him in supporting Romney as our nominee," Palin said. What she was really thinking: "Wow! I really hate that I am not the center of attention! I need the camera on me! What's a girl to do? I will make another last ditch effort and COMPROMISE my position on what GOP candidate I really want in order to get SEEN ON THE BIG POLITICAL STAGE so everyone will think that maybe I'm STILL A CONTENDER. I really don't care who gets to nod, I just need the attention! Oh please oh please oh please John and Mitt, I want to stand with you please! " Palin on Limb-ah's recent barking statement, as per her "he was just using his 1st amendment 'Freedom of speech' on Radio and was forced to apologize by Radical Liberal Democrats". Wow what an anology, forced by liberals not by promoters pulling their fiancial support from Limbaugh radio show. No wonder she supports him because she's is the one too right!!! Pale-in must have a short circuit in her brain, hence she makes a statement first even without thinking. Fox must pay her by the word. They certainly can't be giving her anything for making sense. Not surprised, she voted for Newt for 2 reasons; 1. Newt is nasty and divisive just liker her, 2. Todd told her to. Oh yeah ... It's hard to remember that after carefully vetting Mitt Romney in 2008, John McCain chose Sarah Palin for VP. This is the best news to come from Palin in years: now that she has publically announced her support for Newt and the fact the Newt will be out of the race very soon means that there is no chance of seeing her lurking around te campaign looking for a post. Like was raised in the movie on her, she will do anything to get out of Alaska. Sarah – you've NEVER sounded like a politician. Just and idiot! And, could your sentences be any more rambling? Don't they teach proper grammer up there in Alaska? When Is Saran Palin going to understand that NO BODY WANT HER TO RUN FOR ANYTHING. They just want her to go away and stand away. Just goes to show how fringe Palin is. Gingrich is wrong for the country. Too snotty, too shortsighted, too aggressive, too unsympathetic, I could go on for hours. However, Gingrich's lack of delegates is demonstration enough of how the GOP feels about him, let alone the rest of the nation. "For Sarah Palin being a 'nobody', liberals sure get bent out of shape whenever she speaks. Face it: they are still TERRIFIED of her"
Get out your dictionary and thesaurus... oh, sorry; didn't realize you don't have access to a dictionary or know what a "thesaurus" is, so here's the short course: there's a vast and polar difference between "terrified" and the following TRUE states of mind of people who would joyously cough up big money to pay Sarah's one-way airfare from Attu Station to Petropavlovsk-Kamchatsky, Russia: Instead of your garde-school ALL Caps "terrified," try these: "bored," "fed up with," "sickened to point of vomiting" - I'm sure, with your razor-keen intellect, you get the gist. 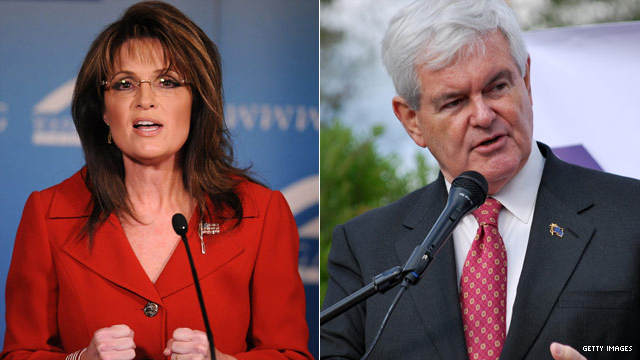 Gingrich and Palin are both political dead weights - whatever cult-follower, religious crackpot, or straight-out lunatic the RNC tries to foist upon the voters come actual campaign time, Palin and Gingrich's support will be as welcome as "Where's W's?" was in 2008. They're both already in the dust-bin of history, with Michelle Bachmann, Jan Brewer, Bobby Jindal, and every other "24-hour-news-cycle-wonder" the Baggers have found crawling out from under a damp rock. I'm surprised they let Palin vote in Alaska. She's jerked them around enough up there.